Daydreams, textbooks, freshly sharpened pencils and gossip – Verve takes you back to simpler days. 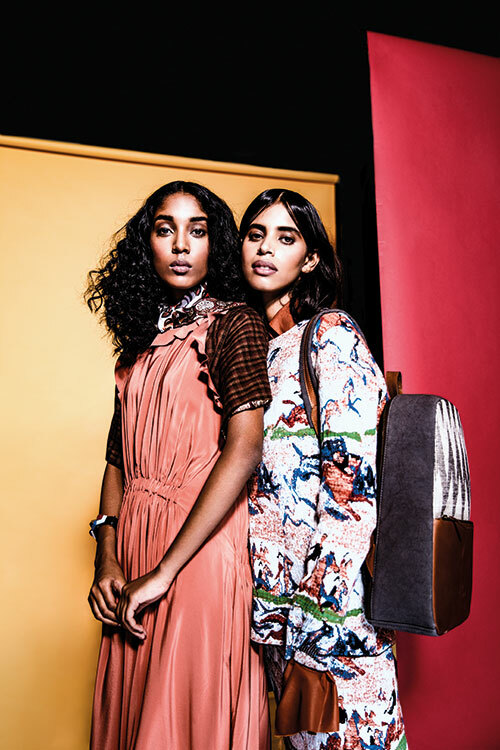 Get schooled in girlish ginghams, sporty graph checks and fuss-free collars that are finding their way into demure yet daring silhouettes. Black and ivory tuxedo jacket, pants, both from Gucci; checked sheer blouse, from Dming, at Aza. Both in Mumbai. Long-sleeved powder-blue shirt, by Dhruv Kapoor, Gurugram. Woollen grey blazer, charcoal-grey skirt, both from Rara Avis, New Delhi. Embroidered and embellished peplum top, by Pallavi Mohan, for Not So Serious, New Delhi. Twill powder-blue shirt, from H&M, Mumbai. Gold hoops, from Dhora, Jaipur. Gingham shirt, waistcoat, both by Aneeth Arora, for Péro Men; grey trousers, from Antar-Agni. Both in New Delhi. Tartan blazer, from H&M, Mumbai. Bordeaux leather belt, by Dhruv Kapoor, Gurugram. Monochrome checked jumpsuit, by Ashish N Soni; maxi black wool jacket, from Fendi. Both in New Delhi. Black booties, by Michael Kors, Mumbai. Left: orange silk wave detail dress, multicoloured bracelet, both from Fendi, New Delhi. Dark walnut woollen bolero, from Chola; Mitzah paisley in silk twill scarf, from Dior. Both in Mumbai. Right: long-sleeved maple brown shirt, by Dhruv Kapoor, Gurugram. Ikat backpack with leather detailing, from Cord, New Delhi. Jacquard knit top, skirt, both from Dior, Mumbai. On Siddharth: grey checked blazer, trousers, both by Paul Smith; powder-blue pinstriped shirt, from H&M; striped tie, black sneakers, both from Dior. All in Mumbai. On Suzanne: patchwork denim culottes, from Doodlage, New Delhi. Pinstriped shirt, by Mary Katrantzou, at Le Mill; polka-dot socks, from Happy Socks. Both in Mumbai. Embellished booties, by Sanchita, Bengaluru. 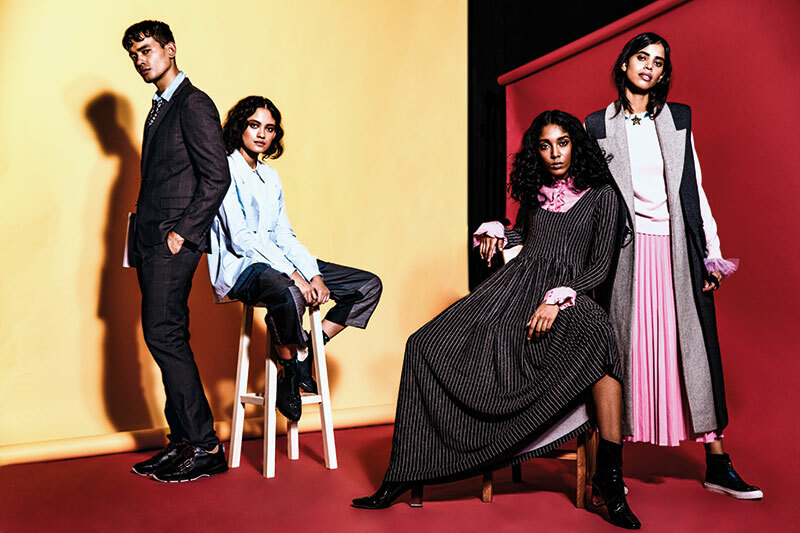 On Naomi (centre): pinstriped wool maxi dress, from Rara Avis, New Delhi. Sorbet pink chiffon shirt with frill detailing, from H&M; ombré vinyl booties, from Zara. Both in Mumbai. On Ritu: grey maxi jacket in wool, by Dhruv Kapoor, Gurugram. Embroidered cashmere sweater, by Mary Katrantzou, at Le Mill; sorbet pink pleated skirt, from H&M. Both in Mumbai. Electric-blue embellished high-tops, by Sanchita, Bengaluru. 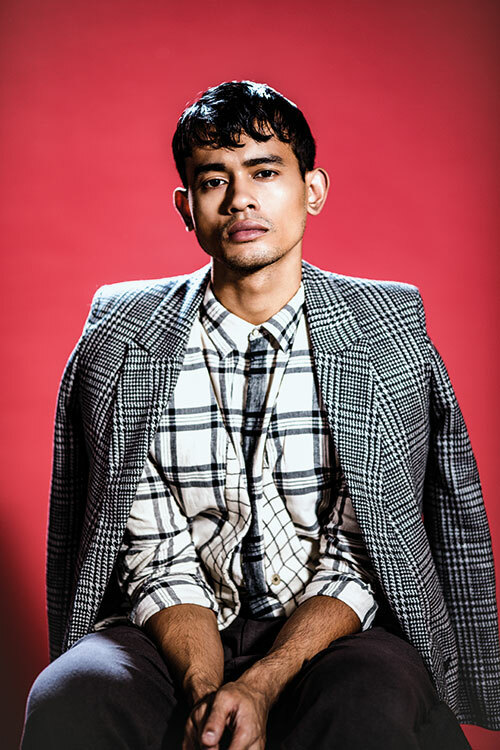 On Siddharth: black checked shirt, black gingham blazer, both by Aneeth Arora, for Péro Men, New Delhi. On Ritu: monochrome polka-dot top and monochrome checked jacket, both by Ashish N Soni, New Delhi. Zebra-striped midi skirt with frill detailing, from Kenzo x H&M, Mumbai. 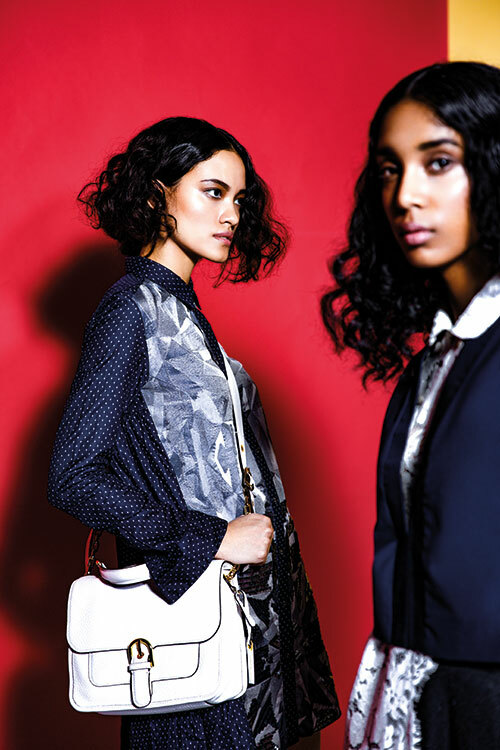 On Suzanne: gingham trench dress in wool, by Aneeth Arora, for Péro, New Delhi. Monochrome striped duster jacket, by Ashish N Soni; fur Flowerland collar, from Fendi; black constellation print clutch bag, from Cord. All in New Delhi. Black pinstriped culottes, from Chola; scarlet raw silk top, by Payal Khandwala. Both in Mumbai. On Siddharth: ivory checked trousers, by Aneeth Arora, for Péro Men, New Delhi. Ivory appliqué sneakers, from Gucci, Mumbai. 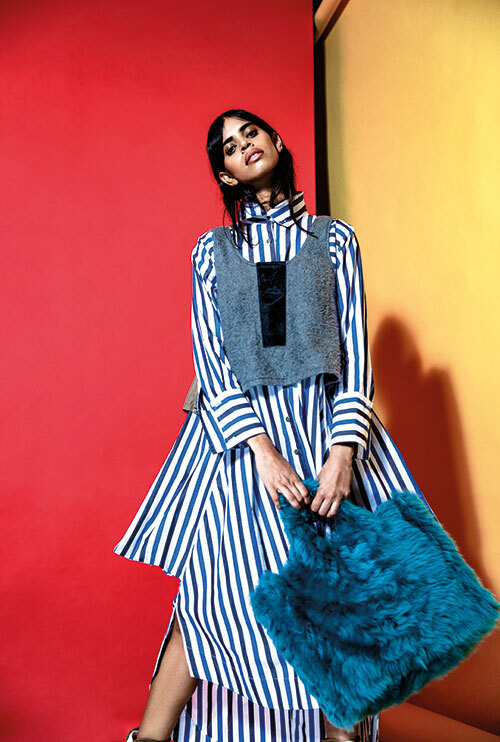 On Suzanne: striped woollen socks, by Aneeth Arora, for Péro, New Delhi. Black pumps, from Gucci, Mumbai. White skirt, from Intrinsic, at intrinsic.in On Ritu: black lambskin platform low boot, from Dior, Mumbai. 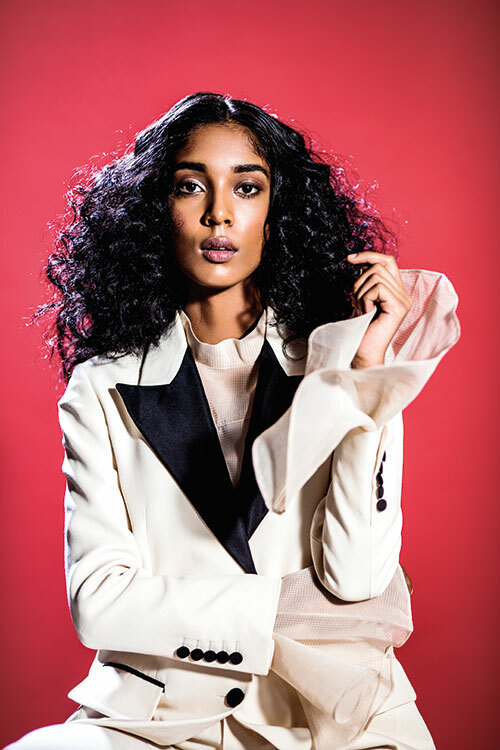 Ivory silk shirt, from Lovebirds, New Delhi. Beige knit top, blush pink twill skirt, twill scarf and ‘My Lady Dior’ bag in black lambskin with customisable strap with lucky badges, all from Dior, Mumbai. Grey wool crop top with velvet panel, from Rara Avis; teal tote in sheepskin, from Fendi. Both in New Delhi. Multicoloured striped asymmetrical dress, from Chola, Mumbai.